Come on in! 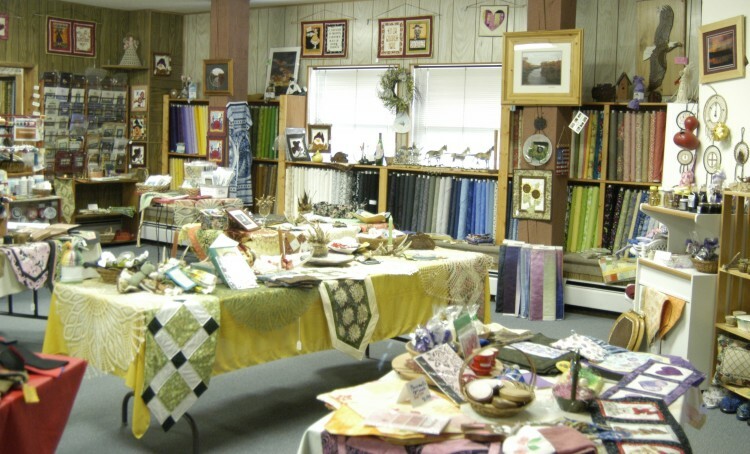 Fabric art, pottery and ceramics, jewelry, clothing, and decorations invite you to relax and wander. (Item #6-001) Dinosaur, $35. 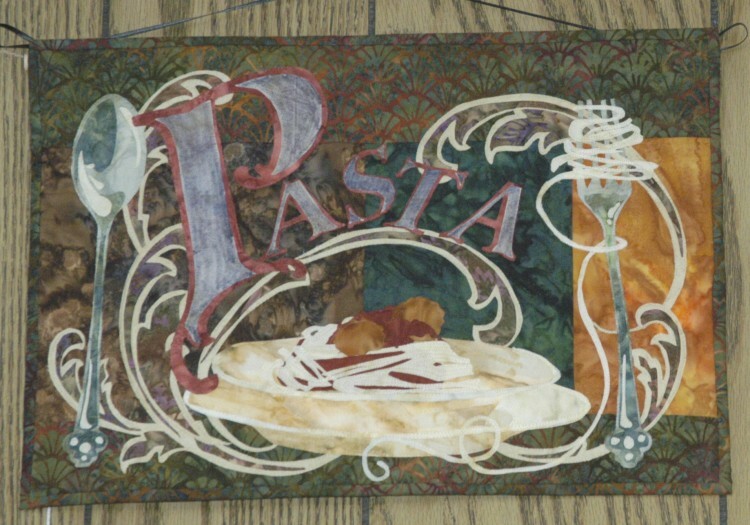 Many small wall hangings adorn the shop walls. 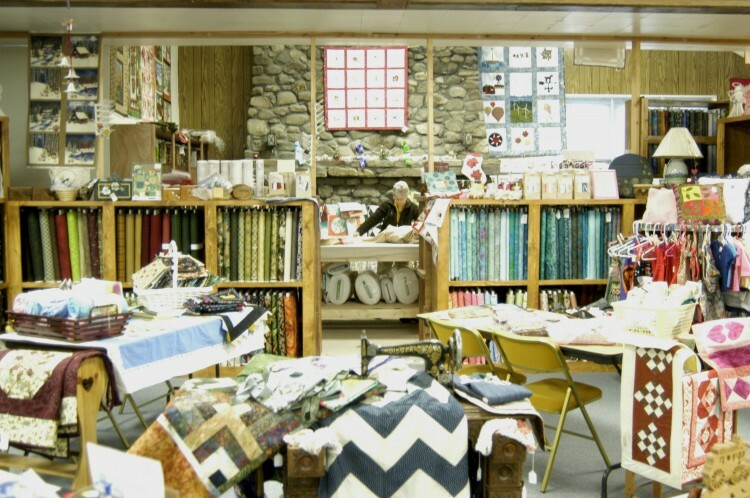 Fabric art improves room acoustics, makes spaces sound more intimate and friendly. 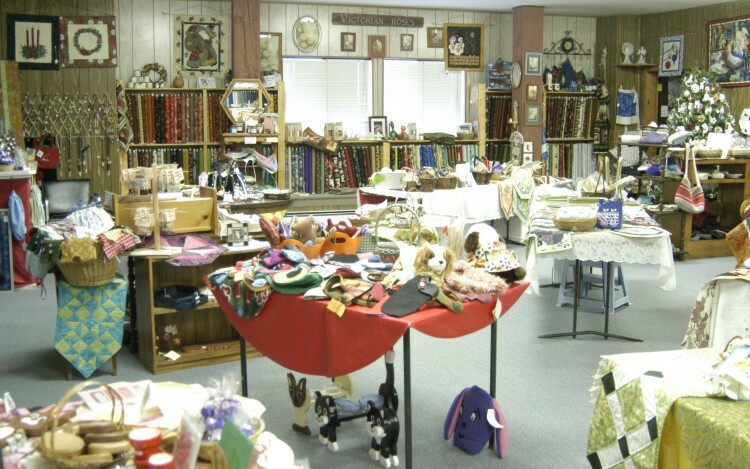 A few special exhibits of vintage fabric art are displayed with the items for sale. Our building has an interesting history. It was built in 1929 as an armory and VFW hall. Some individuals still living here remember being deployed from this building during world War II. It has also been a bakery and a church. 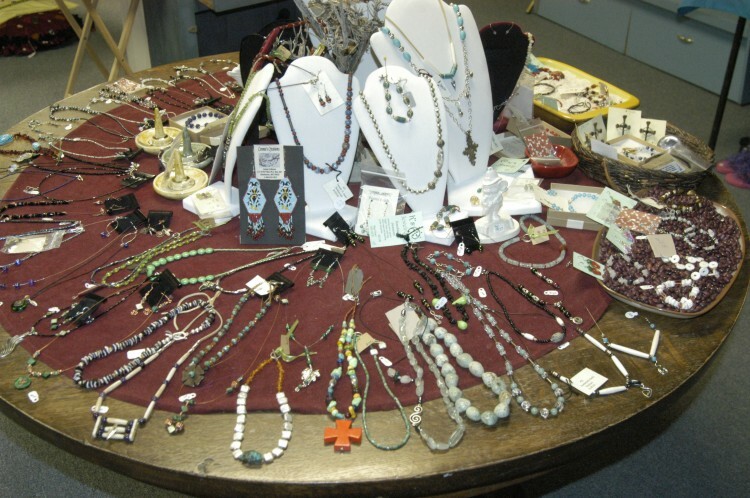 Many pieces are Western and outdoor themed. I sell art and gifts of many types. 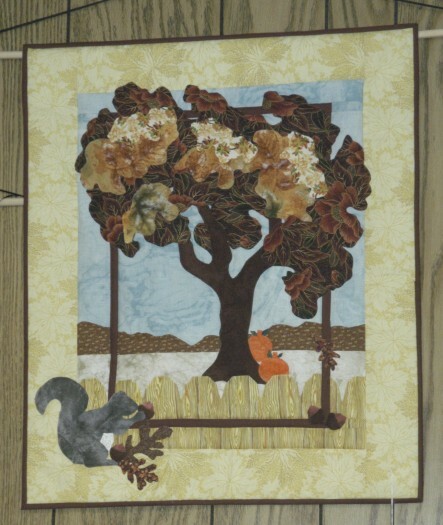 (Item #6-148) Fall Tree wall hanging for sale. 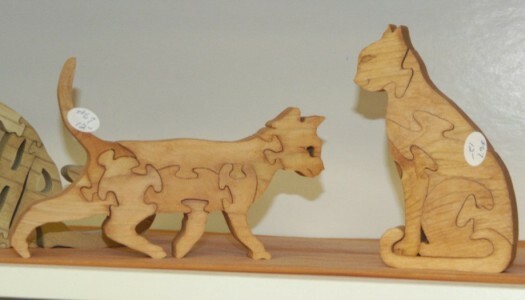 It measures 22 & 1/2 x 26 & 1/2 inches, $35.00. 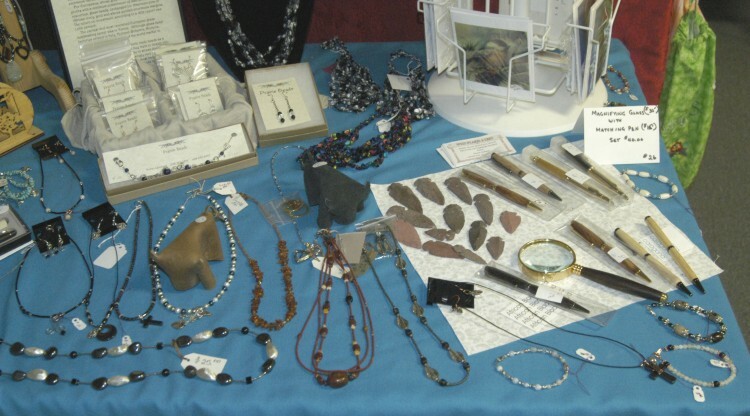 I offer jewelry, clothing, purses, and other personal attire items. 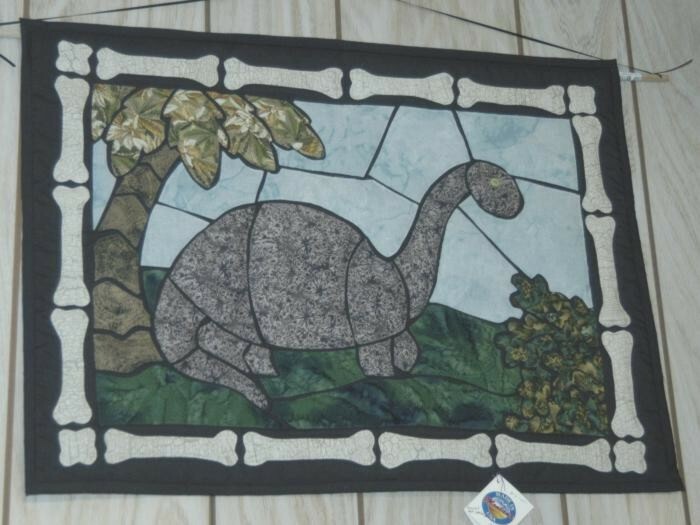 (Item #6-793) Wall hanging for sale. It measures approximately 18 & 1/2 x 13 inches, $45.00. 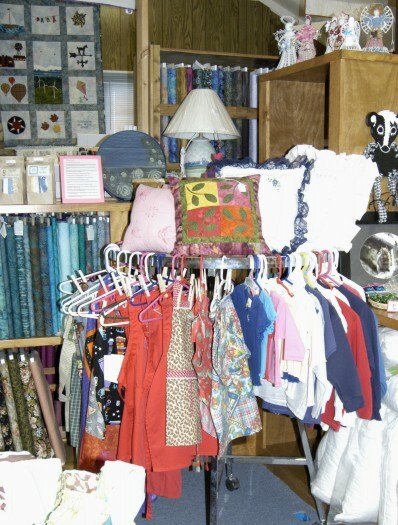 You will find household and holiday items. (Item #6-878) "Dora", raw edge applique pattern by McKenna Ryan, $48.00. I teach this technique in my Raw Edge Applique class. I have elegant Montana gift bags - a delicious way to say Thank You. Honey and coffee flavors vary. Some baskets have barbecue sauce in place of the jam, others have huckleberry bark in place of the jam. 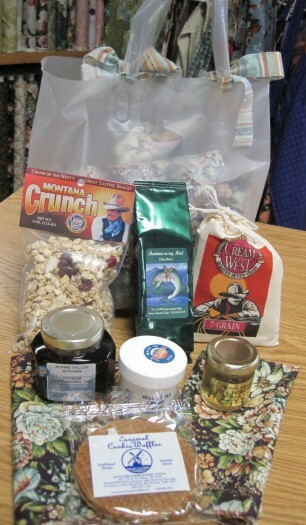 Here's a link to a big photo of a Montana gift bag. 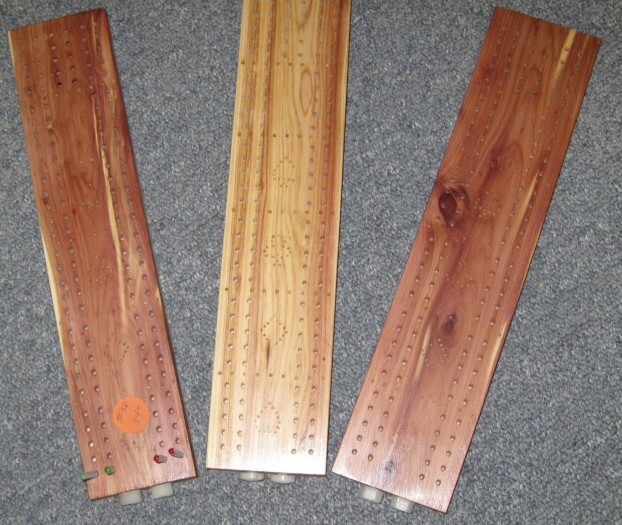 Hand made wooden cribbage boards, $34.00 each. 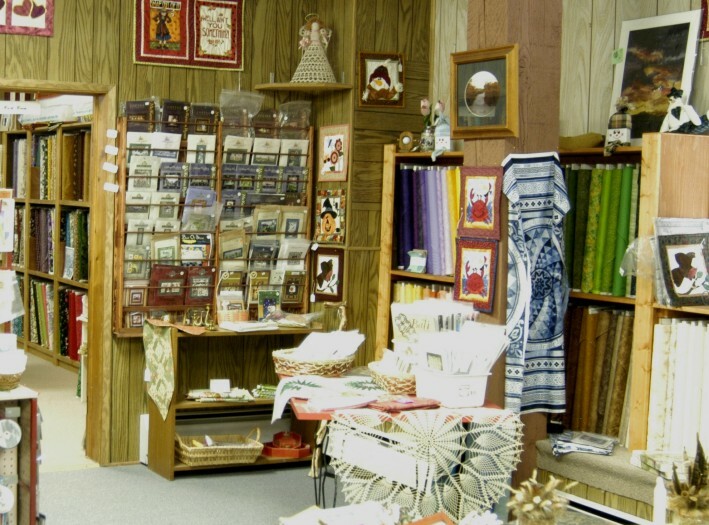 Find souvenirs by local artists. Somehow, we manage to display it all, for your enjoyment. Most of these items are unique and cannot be completely duplicated. 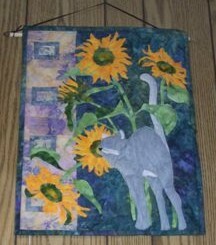 If you want to build a wall hanging similar to one of these, I can help you choose a pattern and materials to order. 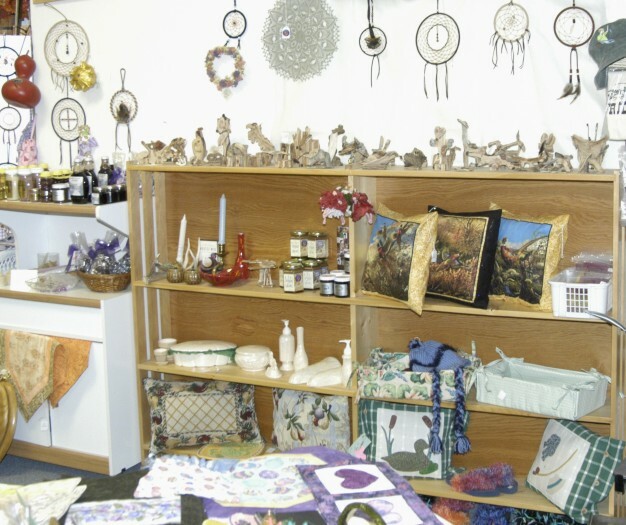 Regular store hours are 9:30-5:30 Mountain Time, Monday-Friday, 9:30-5:00 Saturday, year round. Please contact Diana Day if you wish to schedule a visit at another time. The photos on this page are copyright by K.G.H. Nicholes and D.Day. You may copy and print them for your personal use, but republication requires permission.